A number of "carplanes" have recently appeared on the market or will be appearing soon. The purpose of this site is to contrast and compare these vehicles and to provide the latest information on each. It is an unbiased site that is not funded by any of the manufacturers. No price and no availability date. Its a 4-person enclosed, 3-wheel vehicle that flies via ducted-fan technology for vertical take-off and landing ability. Road speeds are not quoted but they're talking 300 mph for the air speed and lately they have been talking about "complete automated flight systems" for the vehicle. They have a 2003 video on their web site showing the thing getting about 10 feet off the ground. A May 2013 email I received from them indicated that they may produce a vehicle in China and the rotary engine in Phoenix, Arizona. They always seem to be courting investors and in late 2013 launched a crowdfunding campaign; which they are doing again in 2018. Truthfully, the more information I get from them the more conflicting signals I get as to what they are actually doing; if anything. Even now in 2018 raising money still seems to be their main activity. Located in California. Terrafugia's second carplane design, the TF-X, is gone and has been replaced by the TF-2. The TF-2 is envisioned as a 4-person pod carried-about by a 1-pilot vertical take-off and landing transport vehicle in the air and a separate electric-hybrid truck-like vehicle on the ground. Definitely not a carplane and not really a typical air taxi but rather an unusual mixed transportation concept. When flying, eight electric motors will provide a 140 mph cruising speed and a 185 mile flight range with a payload of 1200 pounds. They are touting a prototype in 2019 and delivery in 2023 but that's hard to believe. Located in Massachusetts. $49,300 kit but no availability date Its a 2-person motorcycle that flies as a Light Sport Aircraft via a removable set of wings. Ground speed is whatever a small motorcycle will do and the anticipated maximum air speed is 138 mph. The major drawback to this design is that you have to leave the wings behind at the airport when you drive away, which forces you to return to the airport to pick them up. Located in New Jersey. $450,000 but no availability date Its a 4-person car that flies via ducted-fan technology but without any vertical take-off or landing claims. Max anticipated ground speed of 85 mph and max air speed of 220 mph. Their web site says that the project is on indefinite hold. Located in Washington and Maryland. New in 2014, its basically a jet engine attached to the top of a car with folding wings. Just a bunch of pretty pictures. It is a 2 person enclosed cockpit vehicle with a hybrid electric-gasoline propulsion system that is expected to deliver an impressive maximum airspeed of 197 mph and surprisingly short take-off and landing distances of only 400 feet. The wings must be manually stowed and deployed. An actual vehicle exists and that vehicle has undergone some low level flight testing. Located in California. New in 2014, this French powered parachute concept looks alot like the ITEC Maverick flying car or the Parajet Skyrunner. I've asked for some specifics but haven't received a response yet. This is an eight-rotor, 5 person enclosed helicopter that has 4 wheels for land operations. They completed low level flight tests in March of 2014. Located in California. Lot's of background material on carplanes here; no reason to repeat it. Some interesting information on "old school" flying cars. After some begging and pleading they finally mentioned this site in one of there 6 zillion publications (a March 7, 2012 article). Thanks AOPA, I'm renewing my membership. Video of the what was called the world's first "flying car". Notice that's it is not really a carplane since the wings do not travel with the vehicle - it must "backtrack". Here's a video of the Martin Jetpack going more than 1000 feet in the air making an emergency landing via a ballistic parachute. And here's an article on the $250,000 JB-10 jet pack. Here's a video of the Puffin concept. MA Hoverbike - A really cool ducted-fan "Helicopter"
Here's a video describing the MA Hoverbike. An English firm is making this unique "quadcopter" for the US Military with a facility in Maryland. A ducted rotor personal aircraft that will be flyable with little or no training. Another ducted rotor personal aircraft - the prototype is flying right now but even the inventor calls it dangerous. 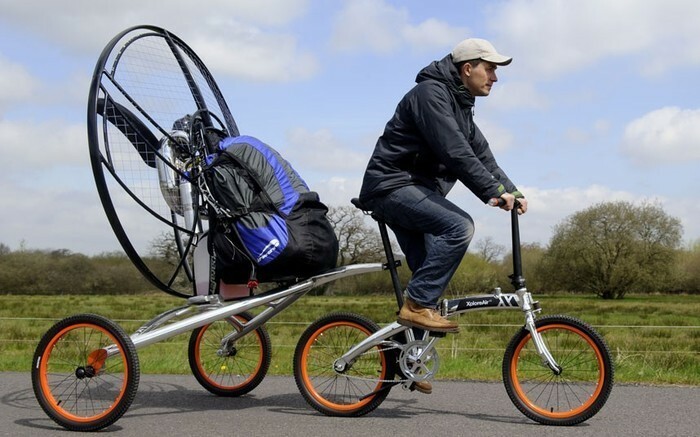 Three ducted fans give this bicycle its "wings". They are in the testing phase and expect a price of $100,000 when it hits the streets/skies; whoa that's not a cheap bike. Fly for an hour at 60 mph with a maximum pilot weight of 220 pounds. They said it was coming out in 2016 but that's not happening - so its wait and see if they can finish the testing and get it into production.